Is It Time to Retire the Rusty Old Drop box? Switch to Kiosks. Everyone is familiar with the rusty old drop box. For years it’s been a quick and easy way to drop off payments… but that’s where the benefits end. Although convenient, drop boxes are insecure. If stolen, the cash is removed and checks are thrown out, which leaves both customers and businesses unhappy. So what’s the alternative? It’s time to consider payment kioks. They’re a payment solution that’s perfect for both parties. Customers manage their transactions privately, without the help of a staff member. For businesses, like water departments, it cuts lines and wait times, which frees up the counter staff. 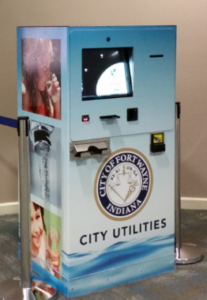 Not only do kiosks make the payment process more efficient, but they can be customized to the needs of your water department. They can display the amount due for each customer by pulling up the customer’s account information. This is as easy as scanning a barcode on the bill for automated look up, or searching for their account number via touch screen. Business have also added payment options. Most people today don’t carry cash, and even fewer carry around their checkbook. With drop boxes, customers can only pay by cash or check, while kiosks allow them to pay by credit card too. Water departments gain added features as well. The machines are automated so each deposit is processed electronically. Kiosks produce reports for balancing and auditing. Both of these solutions eliminate errors that are bound to occur as staff members rush to process a line of payments quickly. They free up staff time too, so should a more complex problem arrive, customers can be helped immediately. If your water department still uses the rusty old dropbox as a payment solution, it’s probably time to retire it. Kiosks are easy to use, more efficient, and streamline the payment process for both you and your customers. F&E PaymentPros has customizable kiosks that are the perfect addition to any water department’s payment solutions. For more information, visit www.waterpaymentsolutions.com. More companies and organizations are taking on the task of processing receivables in-house. This process can become hard to manage, especially for those who process large volumes while trying to maintain quality customer service. Organizations who switch to digital remittance software and Digital Accounts Receivable are able to cut costs, and improve their processing and customer service capabilities. Here are some frequently asked questions regarding Digital Accounts Receivable. Why Do Water Departments Need Unique Solutions? We’ve previously discussed problems associated with gaps in payments, and the fact that it’s a significant strain for utility companies across the board. For the vast majority of water departments, monthly bills are all sent out and due at the same time, thus leading to a huge influx of payments as soon as the bills are received by the customer, and again just prior to the due date. When it comes time to pay the bills each month, there’s two types of people: the early birds and the strategic payers, aka the procrastinators. Historically, the early birds pay immediately because they want to make sure they don’t forget about the bill and that they’re not going to get slapped with late fees by unintentionally missing the due date. The procrastinators on the other hand wait until the last possible moment to pay their bills because if the bill isn’t due, why bother paying beforehand? With the addition of online bill pay offered by most banks, new challenges are introduced because often times the payer doesn’t have control over when the payment is actually sent. In many cases, these payments arrive late causing extra burdens on the staff explaining to customers why, although they think they paid their bill on time, the payment was received after the due date. Leaving water billing departments’ staff ready to scream! Fluctuations in labor can cause a multitude of problems for your billing department. Either your employees are struggling through the busy weeks when payments are flooding in and you are understaffed, or employees don’t have enough work to keep them busy during the slow middle weeks of the month… that lull between payment send and payment due dates. This makes scheduling difficult for business leaders in your water department, but digging deeper, how are fluctuations in labor affecting your employees’ morale, and how can specialized water payment solutions fix that? 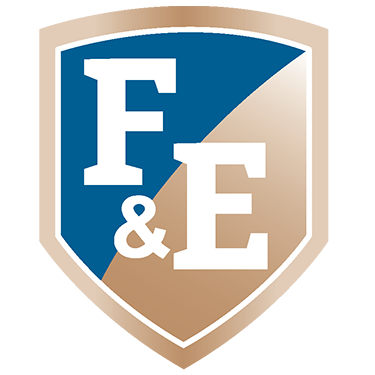 F&E has been in the business of providing payment solutions for over 100 years. In that time we’ve been able to help our customers simplify their financial operations while reducing cost and labor hours. We understand that each industry faces different challenges, so we provide specialized payment solutions for water departments that will optimize your business. To learn more about F&E Payment Pros and our unique payment solutions, watch our video.